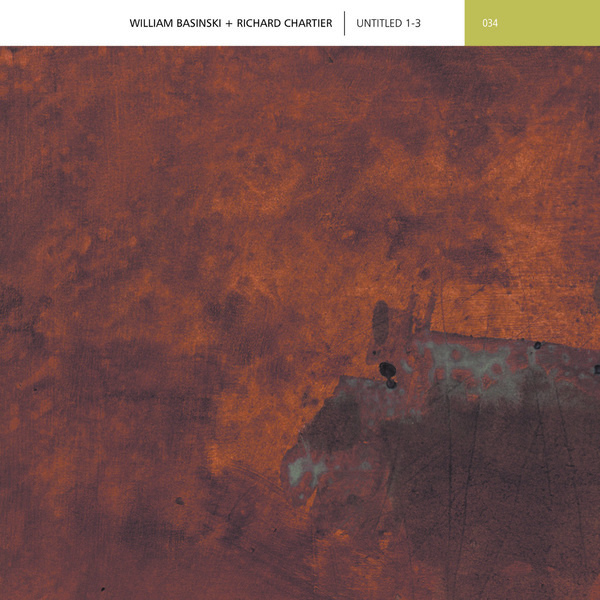 LINE is proud to release this new updated and remastered version of William Basinski and Richard Chartier’s universally acclaimed work Untitled 1-2. Originally released in 2004 on the noted Japanese label Spekk, the original edition of 1300 sold out within 2 months. This new version Untitled 1-3 includes two new works ‘Untitled 3′ and ‘Untitled 3 (reprise)’ and has been remastered with care by Taylor Deupree. “Untitled 1″ contains Chartier elements from 1991-1992 and Basinski elements from 2003 using the Voyetra 8. “Untitled 2″ contains Chartier elements from 2003 and Basinski tape loops from 1981 and 2001 using the Voyetra 8. “Untitled 3/3(reprise)” contain Chartier elements from 1993 and the 2006 sound installation Mixing Desk commissioned for the Bleeding Edge Festival at the Montalvo Arts Center in Saratoga, California and Basinski elements from 1997 using the Voyetra 8. “Untitled 3″ mixed by Basinski. “Untitled 3(reprise)” mixed by Chartier. “Richard and I became friends after meeting at Tonic in NY when he and Taylor Deupree did a show with Carsten Nicolai. He contacted me about a possible collaboration and sent me a track which I thought was very rich and harmonically similar to something I had recently been working on, a very swampy, dark piece I was calling “The Garden of Brokenness” after a very beautiful new installation by James Elaine. I popped it into pro tools with my piece and something really special was happening, so I spent a few weeks weeding my track, trying different things…eventually I stripped it way down and we were both quite happy with the result. Richard came up to NY and we fine tuned it a bit together and it was done. Since the piece had changed quite a bit we decided not to use that title for this piece. He then sent me another one and again, it just worked with something else I had been working on…the second track came together very quickly, and there you have it! I love Richard’s work…very elegant, like the man!” – William Basinski. Last 20 Copies just found!